Home » INSIGHTS » How much time will it take for India to go from cash intensive to a less cash economy? How much time will it take for India to go from cash intensive to a less cash economy? In an era where the world is talking about cashless economies and the benefits that come with it, there has been a major push from the Indian government to usher our country towards a digital and cashless era. A major step in this cashless campaign has been the current demonetization of the INR 1000 and INR 500 which has sucked out around 15 lakh crore from the economy and it doesn’t plan to replace all the money in cash. Various steps have been taken after demonetization to help the public with the cashless transaction and create awareness. Though this digital drive, there are various impediments in the path of India moving to a cashless economy like inaccessible banking services, lack of infrastructure to support non-cash payment, internet connectivity, literacy, Black money etc. The problem does not end with these superficial aspects. India being one of the most cash intensive economies in the world, the requirement for cash costs the reserve bank and commercial banks annually 21,000 crore ($3.5 Billion). India has cash to GDP ratio of 12%, which is amongst the highest in the world. 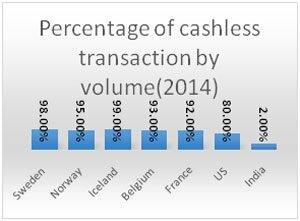 There have been many talks regarding why India doesn’t have to become a less cash economy but let’s see how India fares with respect to other close to cashless economies in the world. Also, the time required for us to reach that stage depends on four important parameters i.e. Literacy, Internet Penetration, Banking Coverage, Payment Infrastructure (Debit Card, POS) and Percentage of Cashless Transactions (By Volume). The countries considered for comparison here are Sweden, Norway, Iceland, Belgium, France and USA. India ranks 92nd in education in the list of 142 countries and last in the list of 6 countries considered. The literacy rate in India stood at 55.3% as of 2001 which increased to 74.04% as per the census in 2011 and is expected to reach 80% by 2015. So this gives us a CAGR of 1.95% from 2011 to 2015. 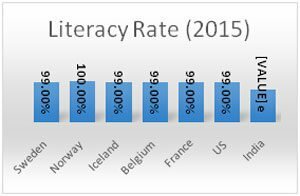 At this pace (as of 2015) India will take another 11 years approximately to reach the 99% literacy rate which is the least for the 6 countries taken in comparison. India fares very poorly when it comes to internet penetration. India ranked 131, out of 189 countries on fixed-broadband subscriptions in 2014, a drop from the 125th rank a year before. India also ranked 155th for active mobile-broadband subscriptions – a significant drop from the 113th rank in 2013. As of 2011, the internet penetration in India stood at 10.1% which increased to 27% as of 2015 giving us a CAGR of 27.87% from 2011 to 2015. 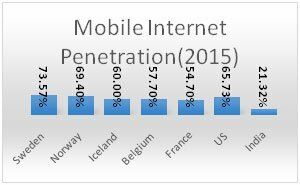 At this pace (as of 2015) India will take another 4.8 years approximately to reach the 87.90% Internet penetration which is the least for the 6 countries taken in comparison. India is home to almost 21% of the world’s unbanked adult population. As of 2014 India’s banking coverage stood at 52.80% up from 35% as of 2011. The world average stands at 61%. The total number of deposit accounts as of 2016 (includes term deposits) stood at 1,440 million. Savings bank accounts as of 2015 stood at 1,170 million and 978 million as of 2014. Though there will be a huge spike in data after the Jan Dhan Yojana scheme, considering the data form 2011 to 2014, CAGR for the coverage is 14.69%. 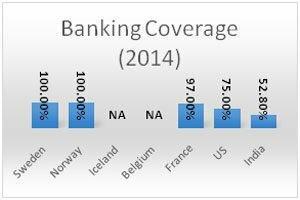 At this pace (as of 2014) India will take another 2.6 years approximately to reach the 75% banking coverage which is the least for the 6 countries taken in comparison and 3.9 years approximately to reach 90% coverage. As of March 2016, India had 661.8 million debit card holders. Usage of debit cards at ATMs still account for 88% of the total volume and around 94% of the total value of debit card transactions whereas transactions at point of sale (PoS) terminals account for only 12% of volume and 6% of value of transactions. In June 2016, the average debit card transaction was 1,311.3 Indian rupees. The average per month per debit card transaction stood at 1.26 as of April 2015. In April 2011 the number of debit cards stood at 230 million which increased to 564 million as of April 2015 which gives us a CAGR of 25.14%. 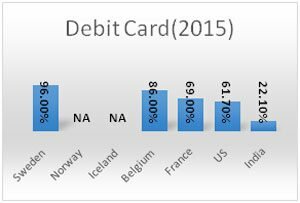 At this pace (as of 2015) India will take another 4.6 years approximately to reach the 61.70% debit card penetration which is the least for the 6 countries taken in comparison. According to a Reserve Bank of India’s (RBI) report released in March 2016, Concept Paper on Card Acceptance Infrastructure, India’s average number of card transactions per inhabitant stands at 6.7 which are among the lowest in the world. 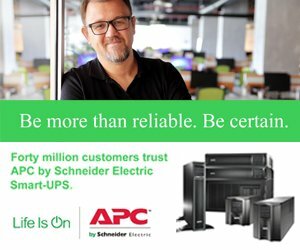 In Australia it is 249.3, in Canada, it is 247.9 in UK, it is 201.7 in Brazil it is 54.8, and in China it is 14.4. The major reason attributed to this low number of transactions is the skewed distribution of POS machines in India, majorly located in urban areas and large towns. Also, low value transactions are discouraged by the merchants. The total number of POS machines issued till July 2016 stood at 14 lakhs. 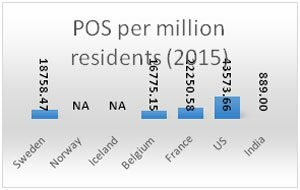 The POS per million residents as of 2015 stood at 889 as compared to 2011 when there were 413 POS per million residents which gives us a CAGR of 21.13%. At this pace (as of 2015) India will take another 15.3 years approximately to reach the 16775.15 POS per million residents which is the least for the 6 countries taken in comparison. Indians are cash intensive and this shows when a meager 2% of transactions by volume are done by digital means. India on the world platform ranks below china (Ranked 15th at 10%). Indian government recently has taken many steps to encourage the population to adopt digital medium of payment. There has been an aggressive push after the current demonetization drive and opening of Jhan Dhan accounts. 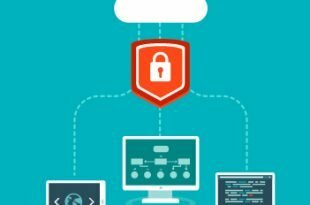 But the mandate lies in the hands of the Indian population to adopt digital means, as the problem seems to be more of psychological than the ease of access to digital means. Though the above parameters clearly show that India is at least a decade and a half away from being a less cash society, disregarding any drastic (current and future) policy changes. 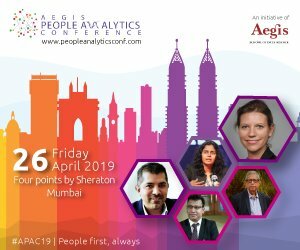 However, considering the current initiatives by the Indian government and ongoing policy changes, which would have already created spikes in the data for the parameters (banking coverage, debit cards and POS machines) for the upcoming year, the above time line can surely be reduced to half.